What Should Your Business Post on Instagram? The first and last point about your Instagram business account is that it is your brand’s opportunity to do exceptional visual storytelling. How you tell that story comes down to the types of photos that you create and share with your Instagram followers. Telling a story is nice. What you want online and in all your marketing, however, is to tell that story to many people by getting more followers. Having your fans share your content, and draw their friends to it with likes and comments, should be a goal of anyone marketing on Instagram. How you will do this is with the type of content that appeals to the Instagram user. We’re going to share the five types of Instagram photos that people on Instagram love to share with their followers, and engage with. This will help your brand start telling its story with as many people as possible. The key to any social media marketing strategy is engaging with your followers. One of the easiest ways of doing this on Instagram comes down to creating opportunities for your fans to create content in a directed manner. You can’t sit back and expect them to make it on a whim. You need to be inspired with real life examples of what actually worked when planning what your Business should post on Instagram .You need to steer the conversation – you are the storyteller for your brand, after all! The easiest way to start this is by letting people know that if they share images of themselves using your product they’ll be included on your brand’s Instagram account. This will prompt people to make their own photos and share them with you. As they share them with you, they also share them with all their friends. Once you have this user-generated content you will begin creating an environment of sharing. Your brand will now have a community, and things can grow quickly once this starts happening. 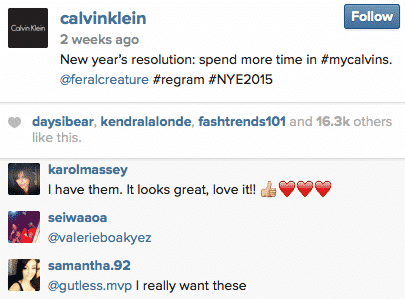 A great example of this is the #MyCalvins campaign. While it has spread all across the social web, the activity on Instagram is of particular note. It’s a bunch of pictures of people in their underwear, so it’s a perfect match for Instagram! Examples include this hyper-timely New Year’s Eve post from a user and this equally timely winter photoshoot. While you may not be able to get pictures of your fans in their underwear, you can get them involved in your Instagram marketing. Think of what your product does for your customers, and encourage them to share images of them using your products. Everyone wants to take a peek ‘behind the curtain.’ On Instagram, this means you have a chance to show off your company culture. This helps you become a group of real people, breaking away from the faceless corporate presentation of old. While some of these photos may not be shared directly, they will increase brand loyalty. When people see that you’re a collection of people just like them they will be prone to following you closely and sharing your content. The hidden benefit behind all of this is how you can increase the desirability of working at your company. Who wouldn’t want to be a little bit Internet famous every now and then on the brand Instagram account? It can also highly increase the satisfaction of your current employees – just make sure they’re not camera-shy! You can think of all three of these techniques as ways to improve your trust levels. Noted bloggers are trusted purely on what they say. If they’re saying good things about your brand that trust transfers. Brandy has a little over 8,000 followers on Instagram. It may not seem like much, but T.J. Maxx uses this technique with over a dozen fashion bloggers. All of that adds up to T.J. Maxx now having over 211,000 followers. All it has taken are a few photos here and there with trusted voices in the industry! @adidasOriginals = @Pharrell Williams. Superstar. March 2015. Your brand doesn’t have to go quite as crazy as this last one, but a little experimentation never hurt anyone. 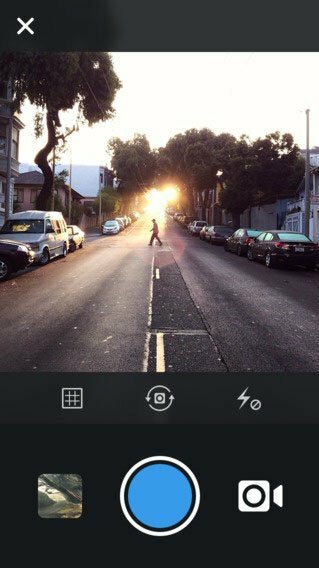 What is the Best Shareable Instagram content? Reading through all of these content ideas should give you a clear idea: Instagram content has to be for your fans, and for the fans you want to attract. Maybe the attraction follows the first point and people come to you seeking their fifteen seconds of Internet fame. Your attraction could be the second point where people want to know more about your brand than the products you present. Every piece of content you share on Instagram needs this type of thought put behind it. If it doesn’t benefit the end consumer in some way, or increase your brand exposure, why are you doing it? Narcissism? Make sure your content marketing plans on Instagram have clear goals in mind that include the customer. Instagram Reviews © 2019 - All Rights Reserved. This website is in no way affiliated with Instagram.